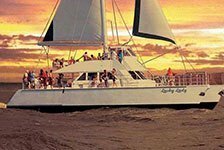 Close out a perfect day on Kauai with a sunset dinner cruise. Opt for a Kauai dinner cruise that includes snorkeling or just sightseeing along the beautiful Na Pali Coast. Get a glimpse of sea life as you sail along Kauai, including sea turtles, dolphins, and even whales.